This was the routine magicians talked most about at Alexander's last lecture tour in Germany, Austria, Switzerland and Holland. Here is the effect: You write a prediction on a card, which is placed into an envelope. This in turn is deposited in a small leather wallet. All this is done BEFORE anything starts and in full view of the audience. A spectator (no stooge) gets a sheet of newspaper. He pretends being a passenger that is sitting and waiting for his train in a train station at a certain track, reading his newspaper. The spectator names freely a train station in any city in the world and the track number he is sitting. Then he is to study the newspaper. You write a second prediction, which is immediately given another spectator to hold. You open the wallet and remove the envelope. From this, you remove the prediction you had written before everything began. On the card is written the name of the freely chosen city AND the track number! Everything can be left with the audience as a souvenir. Here are the facts: This is a combination of the Al Koran Newspaper Prediction along with a very subtle and deceptive strategy. NO stooges, NO impressions, NO preshow, NO double-writing. Just a surefire, very easy to do and strictly one man effect, that really packs small and plays big. This routine is actually TWO separate tricks blended together into a powerful routine that defies explanation. It is thoroughly practical, just replace two blank cards and a new piece of newspaper and you are ready to go again. The routine can be done on stage, parlour, trade shows (great when working for travel agencies) and even close-up (if you take care a little bit for the angles). It is NOT intended for table-hopping, but could be done, if you take a few sheets of newspaper with you and some spare blank cards. Though he does not recommend doing this multiple times in a room. Save it for the big finish at the end of the evening. In the very thorough ebook you find the complete details, how to make the props (easy to find in any warehouse, nothing complicated, most likely you have everything at home already), set-up the routine and how to perform it. Alexander has given you even the patter outline that he uses. The props can be made withing 10 minutes, even if you have no skills in crafting. Cutting a hole and making a slit is all you need to do. As well there is his take on the Al Koran Prediction described, which many performers consider to be the easiest and most surefire way to perform this formerly complicated trick. De Cova's system guarantees that you will never ever again forget the sequence of moves. It is based on what he refers to as 'body memory' and you will love it. 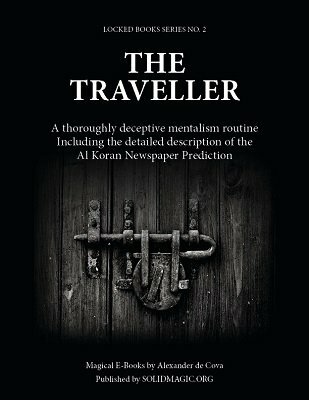 Enclosed with this ebook are also the templates for the gimmick for his handling of the Koran prediction. Just print them out (you will only need one) and you are ready to go. 1st edition 2014, 26 pages.